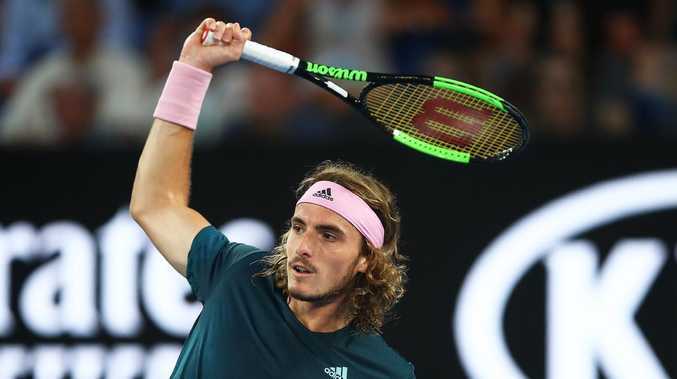 STEFASNOS Tsitsipas was celebrated for his unique personality as well as his tennis skills during a run to the semi-finals at the Australian Open. But his latest post on social media will surely be met with a firm "Da fuq" by Nick Kyrgios - and everyone else. The Greek 20-year-old embraces his weirdness online, sharing his love of filmmaking, philosophy and nature with his fans - and this photograph is as natural as it gets. Kyrgios famously clipped his next generation rival after Tsitsipas tweeted: "It's amazing of how many different sounds you can hear while walking in (the) New York City. Just close your eyes and absorb!" last year. The Aussie responded by saying: "Da fuq", but Tsitsipas wasn't bothered. "Everybody knows who Kyrgios is, let's be honest. I know some people see these things I do as something weird, writing all these tweets that make no sense," he said, before taking a shot at Kyrgios's love of gaming. "It's not sitting in my room playing video games, Fortnite like someone does. It's better going outside and creating something rather than just sitting inside playing video games for the whole day, which I did before and now see no point in doing." Perhaps Tsitsipas is auditioning to be the next tennis player featured in ESPN Magazine's Body Issue. Tomas Berdych, Jon Isner, Serena Williams and Caroline Wozniacki are a few of the ATP and WTA stars to get their gear off in recent years.